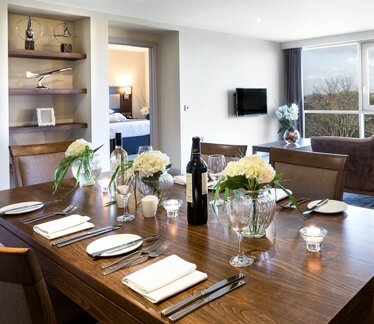 ​Each of the 303 rooms and suites at Heston Hyde Hotel offers business and leisure travellers a chic, luxury retreat in Hounslow. 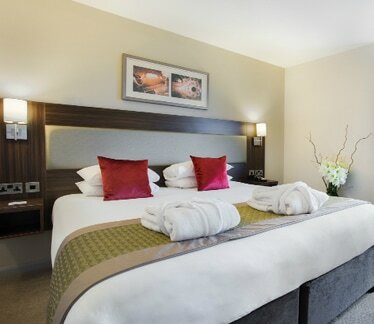 All guest accommodation showcase a keen eye for design and detail with contemporary furnishings and artwork, ultra-comfortable beds and modern conveniences that include complimentary Wi-Fi. Guest room bathrooms feature walk-in showers or bathtub combinations and suites have both bath and walk in showers with a TV, a phone, bathrobes and complimentary toiletries. 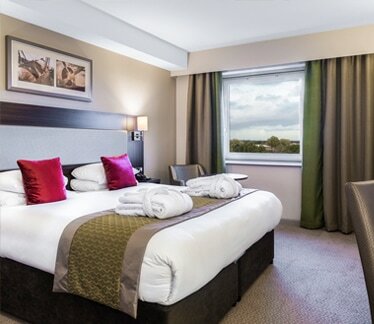 All accommodation at Heston Hyde Hotel are soundproofed to the highest specification, making us one of the quietest hotels near Heathrow Airport. 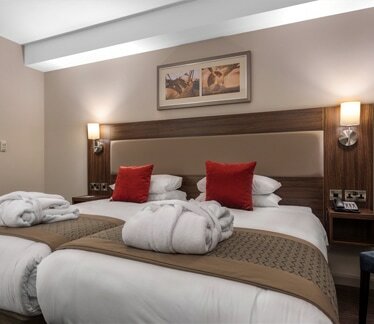 A selection of suites with interconnecting rooms is available for families and children along with a large assortment of accessible rooms. This room measures 27 square meters. The room measures 57 square meters.